If my manicure doesn't get completely destroyed after a day or so of wear (which is usually the case) I like switching it up a bit, usually by adding a topcoat. Matte topcoat is perfect for this because it dries mega fast and gives a really pretty finish, like softly frosted glass. 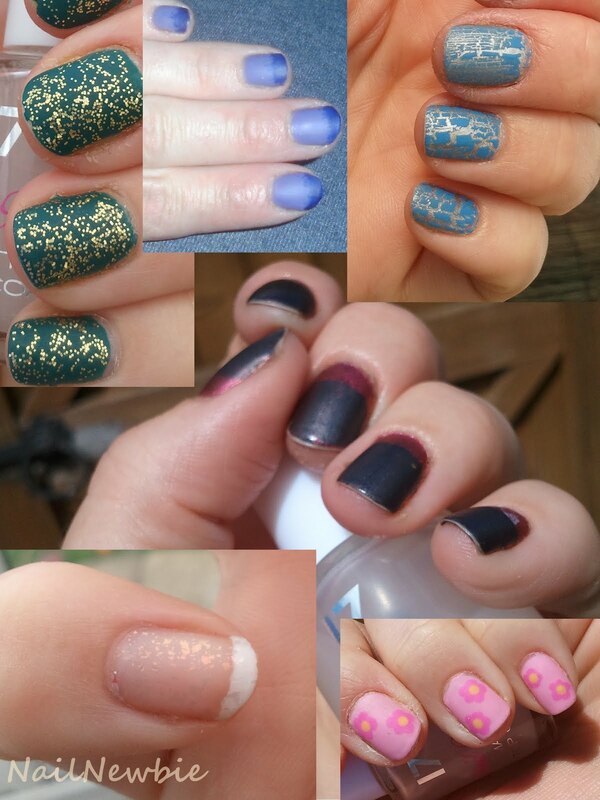 Here are some of the manicures I've mattefied recently. The matte TC is use is by Boots 17 Nail Xtras and I think it's priced around £3.99. There are lots of them on the market though, Rimmel do one, as well as E.L.F, and China Glaze, and I'm sure there are more. One thing I've learned about matte TC's is that if your manicure has more than one colour you will need a good regular top coat before you use the matte one because it will smear otherwise. I learnt this when I mattefied my tiger print mani and it smeared even through a layer of Seche Vite. A TC is a good idea for durability anyway because the matte coat wont add any protection to your polish. They're all so gorgeous . I just love matte manicures .